The remarks by Mazloum Kobani, the commander-in-chief of the Kurdish-led Syrian Democratic Forces, followed talks with senior U.S. generals in Syria and offered perhaps the most comprehensive view to date of his requests for an enduring military assistance from the U.S.-led coalition. It also shows that Kobani is still holding out hope that U.S. President Donald Trump may soften his withdrawal order, which has been criticized by allies at home and abroad and which triggered the resignation of Trump's defense secretary. "We would like to have air cover, air support and a force on the ground to coordinate with us," Kobani told a small group of reporters who traveled with the U.S. military to the talks at an airbase at an undisclosed location in northeast Syria. 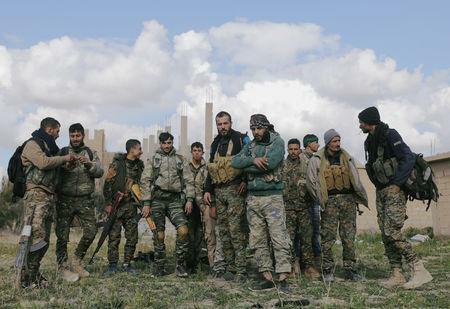 With U.S. help, the Kurdish-led fighters are poised to seize Islamic State's last holdout in eastern Syria. At the height of its power four years ago, Islamic State held about a third of both Iraq and Syria in a self-proclaimed caliphate. But Islamic State still has thousands of fighters, who, now dispersed, are expected to turn to guerrilla-style attacks. Kobani said there was discussions about perhaps French and British troops supporting the SDF in Syria. But he stressed he also wanted at least "a partial group of American forces", who now number more than 2,000 in Syria, to stay as well. "American forces must remain beside us," Kobani said through a translator. 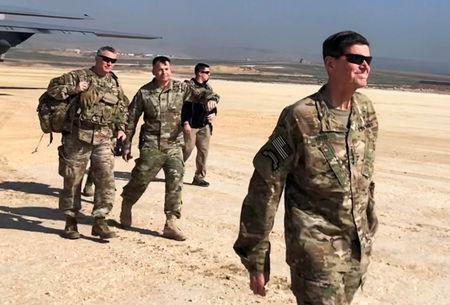 U.S. Army General Joseph Votel, head of Central Command, said after talks with Kobani that he was still carrying out Trump's December order for a complete withdrawal of U.S. forces. "We certainly understand what they would like us to do, but of course that's not the path we're on at this particular point," Votel told reporters. Asked about any discussions on a continuing U.S. presence in Syria, Votel said: "So the discussion really isn't about U.S. forces staying here. We've looked at potentially what coalition (forces) might be able to do here." A Reuters witness said there was a lull in fighting on Monday where Islamic State fighters could be seen strolling in their last neighborhood of Baghouz village, near the Iraqi border where they are sheltering among civilians. SDF commanders said the presence of civilians among the militants was compelling their fighters to proceed cautiously. The U.S. military and intelligence officials have warned of the risk of a resurgence of Islamic State. But the pullout raises an even more immediate concern to Kobani's SDF, which fears that Turkey will make good on threats to attack the Kurdish-led fighters that Ankara brands as terrorists. He warned of a "new genocide" in SDF controlled areas of Syria unless the United States and its allies can reach some agreement with Turkey. Kobani thanked Trump for publicly stating his intent to protect the SDF but said: "I want him to live up to his word." Without a deal with the U.S.-led coalition, experts say Kobani may have to strike a deal with Syrian President Bashar al-Assad to avoid a Turkish sweep or Islamic State revival. Votel is recommending continued support to the SDF as long as it keeps up pressure on Islamic State militants. But Army Lieutenant General Paul LaCamera, who is the commander of the U.S.-led coalition battling Islamic State in Iraq and Syria, said on Sunday the United States would be legally unable to support the SDF if they partnered with Assad or Assad's Russian backers. Kobani said he was not seeking a military deal with Assad. "We’re trying to preserve the current situation," he said, speaking through a translator. "We’re trying to have a political deal with the regime to reach a solution, a constitutional solution, for this part of Syria." Perhaps sensing an opportunity to stoke doubt among Kurdish communities, Assad warned on Sunday the United States would not protect those depending on it. Senator Angus King, an independent from Maine, is among the U.S. lawmakers expressing concern the U.S. withdrawal could deal a devastating blow to Kurdish forces and warned that any sense of U.S. betrayal could cast a long shadow for years to come. "It will chill future potential groups from assisting us if we're going to treat the people who have been so stalwart on our behalf in this way. It is very dangerous in terms of national security," he told Reuters in Washington. Turkey wants to set up a safe zone with logistical support from allies and says it should be cleared of the U.S.-backed Kurdish YPG militia. But Kobani said ceding the area to Turkish control would be unacceptable to the SDF, which is led by Kurdish fighters but also includes Arabs. 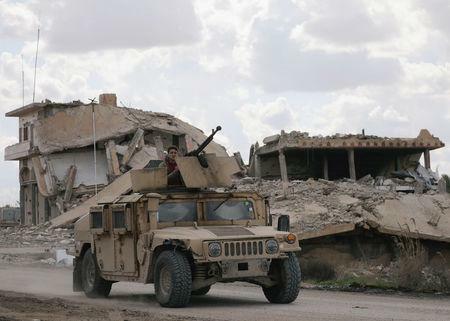 The United States is hoping allies will contribute forces to help stabilize areas freed from Islamic State. But it is unclear which allies will send their troops once U.S. forces depart. A French diplomat said Europeans would not provide troops when it was completely unclear what the objectives of such a safe zone would be or how this would monitored or guaranteed. "For now, there is no plan," the diplomat said.